CityWide Container Service is proud to work with Tishman in supplying containers to create one of New York's newest prestigious projects. The building, which will soon stand at 1,296 feet, is on its way to becoming the newest addition to New York's famous skyline. This 2,600,000 sq. ft. building is projected to open in 2019. Commonly known as The Hub, this is considered to be the tallest building in Brooklyn -- standing at 610 feet tall and housing 52 floors. CityWide is there to provide container service for this project. Completed in 2016, it stands as a proud addition to CityWide's project completion resume. Expected to be completed in 2019, this project will stand as the tallest building in New York City, according to roof height. Due to base elevation, the building will surpass the 1,600 feet tall measurement, leaving quite the impression on New York City. 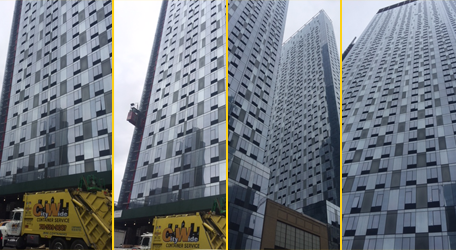 Standing at 953 feet tall and including 69 floors as well as 118 apartments – this project stands as one of CityWide's prime accomplishments. 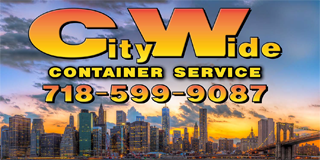 Working with Lendlease and providing containers to the job site allowed for positive and efficient work to be completed, creating yet another impressive feat in New York City. This 578,000 sq. ft. project is prime real estate in New York City. Sending containers to assist Hudson Meridian Construction Group allowed for the creation of these upscale residential towers that include a private park covering 1.6 acres of land, making it one of New York's largest living spaces. After the devastating attacks on September 11, 2001, CityWide looked to assist in rebuilding New York City bigger and better than ever before. 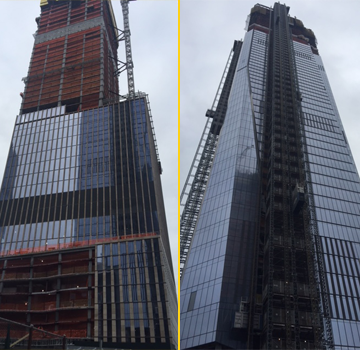 By working with and providing container services to Tishman, the restoration has been in progress. Set to open in 2018, Tower 3 will stand 80 stories high, 1,079 feet tall, spanning 2.5 million sq. ft. of space. Tower 4 stands at a smaller but still very impressive 978 feet high, housing 74 floors — all of which provide exquisite conditions that exemplify what it means to stand tall in New York City.